6 Best Dog House Reviews 2019 - Outdoor vs Indoor Houses? If you have a dog, it’s pretty safe to say that you love them just as much as any other family member and want the absolute best for them in all aspects of their life, whether that’s the food they eat, the toys they play with, or, in this case, the house they rest in. As with most things, however, there are some important things you should know before you go out to buy a dog house for your canine companion. In this article, we’ve broken down the different types of dog houses as well as what qualities to be on the look-out for when you go shopping. And to help narrow down your search even further, we’ve compiled a list of the best dog houses currently available on the market. So read on, and learn everything you need to know before starting out on your quest to find the perfect dog house! At first glance, it might seem like there aren’t a wide variety of dog houses. This first impression, however, is incredibly misleading. There are many different types of dog houses available on the market; some are made of different materials, while others are built in different ways. To help make things a little easier for you to understand, we’ve grouped them here by material type and design. Wood is one of the more traditional materials for the construction of dog houses, thanks to wood being a relatively inexpensive material that is fairly easy to work with. That being said, wooden dog houses can be a little difficult to maintain; if not treated or looked after properly, they could become moldy or damaged in wet and stormy weather, and can start to look a bit ratty and unappealing in general if they’re not made of decay-resistant wood. Within the category of wooden dog houses, it’s easiest to classify the different styles of dog houses by their shape, specifically by the shape of the roof. Pitched roofs – one of the most common styles, this type of roof has two panels of wood joining up into a peak at the center, creating a shape similar to a triangle or pyramid; this style if popular for the way it makes the dog house resemble a human home. Flat roof – a more simplistic style, this type of roof just involves one single wooden board going flat across the top of the dog house. Sometimes a roof of this design will have a slight tilt from front to back or side to side, but not always. Loft roof/deck roof – One of the fancier roofing styles, this type of design involves a deck built on top of the dog house that your dog can get to via a small exterior staircase; this kind of style is popular for giving your dog an extra place to sit or rest. These dog houses are also made out of wood, but are a distinct category separate from other wooden dog houses because they are made out of old wine or food barrels that have been re-purposed and turned into dog houses. Barrel dog houses are popular with dog owners for the pleasing aesthetic of the barrel, and are equally well-liked by dogs for the size and shape, which they tend to find comfortable and cozy. Dog houses made out of plastic are becoming increasingly popular for being cheap like wooden dog houses while also light-weight and easy to maintain. Unlike wooden dog houses that can become moldy or infested with termites, plastic dog houses are pretty much weather resistant and also very sturdy. They are also very simple to put together after purchase; most require little to no construction on your part, often only needing the top to be snapped onto the bottom before use. Like with wooden dog houses, the shape is how you differentiate between the different types. In the case of plastic dog houses, there are three shapes: igloo, barn, and traditional. The names are pretty much self-explanatory; igloo dog houses are shaped like an igloo, barn-style dog houses are shaped like a barn (with a gambrel roof), and the more traditional ones are basically the same as a wooden one with a pitched roof, but done in plastic instead of wood. Dog houses made of metal are considerably rarer and not as popular, but there are some available on the market. Most dog houses made out of metal will be rectangular in shape and built out of heavily insulated stainless steel. While more durable than wooden and plastic doghouses because they can’t be chewed on by your pet or succumb to wood-rot, metal dog houses are not very popular. These types of dog houses are even rarer than ones made out of metal, but there are a few available for purchase if you really want one. Made entirely of heavy-duty fiberglass, these types of dog houses are unbelievably durable, and will never succumb to the elements; you’ll never need to worry about rot or mold, and the fiberglass is strong and secure enough to keep out leaks even in powerful rainstorms. The downside for these types of dog houses is that they are very hard to find, and also very expensive. Just in case you ever need a short-term dog house for your beloved canine, we wanted to cover this particular type of dog house as well. While not designed for long-term use, dog houses of this nature are very handy if you’re traveling or camping. There are quite a few different styles of temporary housing for your pet, but all of them can be more or less divided into two categories: tents and crates. Dog tents are more or less a smaller version of regular tent, sized down with your pet in mind. Some also come with additional features like elevated flooring and zipper flaps. Keep in mind, though, that some dogs like to scratch and dig, and if that is the case with your pet, a dog tent might not be right for them; if they try to dig while inside, it will tear apart the fabric of the tent. Also, dogs that get anxious in confined spaces will probably not be comfortable in a temporary dog tent. 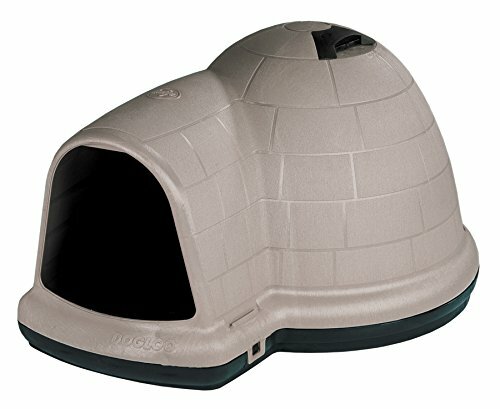 There are also inflatable dog houses (basically inflatable versions of regular dog tents), which are also good for when you’re traveling, but like with dog tents, one of these might not be a good choice if your dog likes to dig or if they might try to chew on the inflatable dog house itself, since this will inevitably lead to the destruction of the product. Dog crates, meanwhile, are one of the most commonly seen types of temporary dog housing, and they come either soft or hard. Soft dog crates are lighter than the more traditional crates made of metal wire and other pet carriers that are made out of hard plastic, and typically consist of soft but sturdy materials making up the crate itself with nylon mesh covering the openings rather than hard metal grates. Standard (or “hard”) dog crates, by comparison, are made of molded plastic and metal; they are typically used for house-breaking and travel, but some owners use their dog crates as housing for their dogs for longer periods of time, particularly if their dog is more comfortable resting in their crate than in another type of dog house. 1. Size – This is probably the most important thing to bear in mind when looking for a dog house for your pet. There are over three hundred different breeds of dog in the world, and each and every one is a different size and shape. Make sure to select a house that is comfortably sized for your specific dog. Some dog houses can accommodate more than one dog as well, so if you have two dogs that like to rest together, make sure to consider one of those. Also, if you’re buying a dog house for a new puppy, remember that they’re going to grow; make sure you pick a dog house that won’t be too small for your dog once they’re an adult. 2. Shape – Some dogs prefer rounder dog houses, while others prefer ones that are more box-like. You might need to explore a variety of options depending on what type of sleeping environment your dog is most comfortable in. Also, in general, make sure your dog house has enough space inside and is shaped to allow for your dog to turn around and stretch out if they want to. A dog house that is cramped or awkwardly shaped will just make your dog uncomfortable. 3. Material – What a dog house is made out of is also a very important factor to consider. Wood is the most common material, but it can succumb to rot and mildew, and will degrade over time. Plastic is stronger, but can still become damaged over time. Metal is sturdy, but not as comfy for your pet. Fiberglass is pretty close to indestructible but also incredibly expensive. 4. Price – As with any product, keep an eye on the cost of the dog houses you look at. While it’s important to buy a good dog house that will improve your pet’s quality of life, some types of dog houses can be quite expensive. Also, it’s always possible that a dog house that you think is perfect is one your dog has no interest in using, and trying to return a product that you’ve already unpacked and used is always a hassle, and sometimes even impossible, meaning that you would be out the cost of the dog house in question. Basically, try to avoid spending too much money on any particular product unless you’re absolutely certain that it’s the right one for you and your dog. One of the most popular dog houses on the market, this one is made of heavy-duty materials that make it resistant to the elements, which keeps your pet safe from the weather while prolonging the life of the product itself. This product was also made with Microban, a form of antimicrobial protection, that helps prevent the growth of bacteria in and on the dog house, which is very important for your dog’s health. This particular dog house if igloo-shaped, with an extended entryway for easy access and extra space. There is also a ventilation shaft built into the roof of the dog house, to allow for continual air flow. This dog house comes in three sizes: medium, large, and extra large. The different sizes have different costs, with the medium being the cheapest and the extra large being the most expensive. This dog house is made of incredibly durable plastic, and utilizes double-wall construction that creates additional insulation, making this a good choice if you want a dog house that your pet will be comfortable in all year round regardless of the weather. It can be used by any dog weighing up to a hundred and twenty-five pounds, and is also incredibly easy to clean thanks to its simple and straightforward design. It is also very easy to assemble; the pieces snap together easily, and no additional tools are needed. Do keep in mind, however, that while this dog house can withstand certain types of weather, such as rain and wind, it is not designed to protect your pet in extreme weather situations such as blizzards or floods; make sure to bring your pet indoors in the event of such conditions. 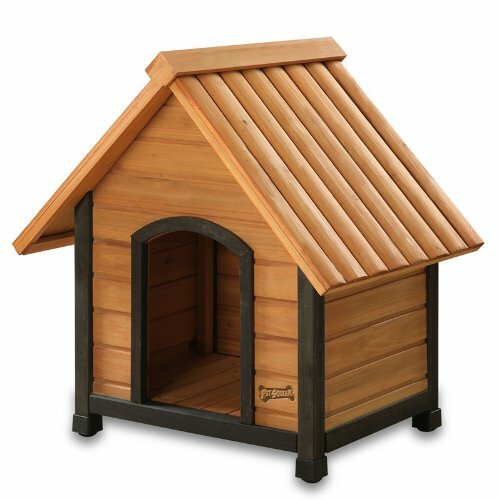 This dog house comes in three sizes (small, medium, and large) and is made out of wood. It is incredibly easy to put together after purchase, and is very lightweight, making it easy to move around and clean. It’s also very sturdy, despite being light-weight. Also, it is made of entirely non-toxic materials, so you don’t need to worry about your pet’s health when using this dog house. It’s also fairly weather resistant, although it is made out of wood so be watchful if you live in an area with lots of moisture because this could lead to mildew and rot after a long period of time. 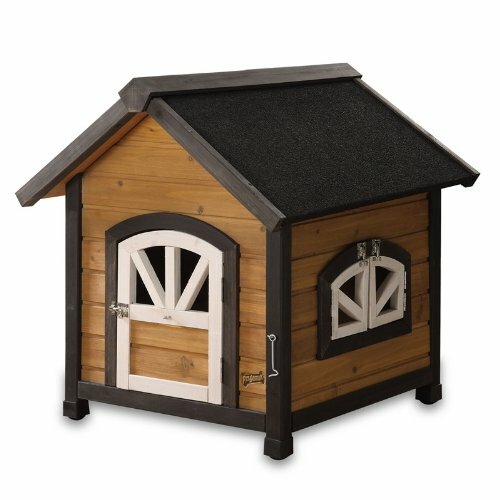 This dog house also comes with an attached door that can be closed or left open. Additionally, the floor of the dog house is raised, which keeps it up off the ground; this is a good feature to have, since other dog houses that sit directly on the ground absorb moisture from the dirt and can also become infested with insects over time. Another dog house made by Pet Squeak, this product is made White Cedar, also called “whitewood”, a type of wood known for its pest-resistance and pleasant aroma. Like the Doggy Den, this dog house has a raised floor and is both lightweight and durable. 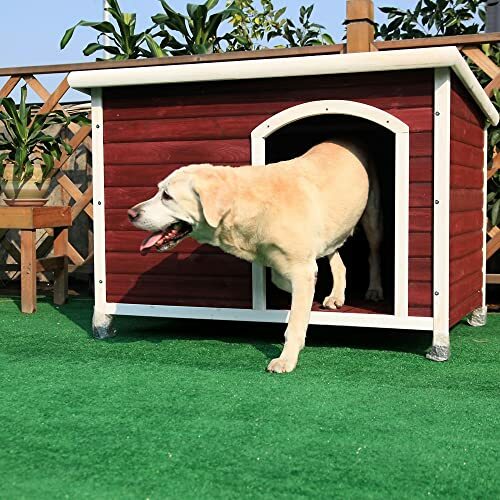 This dog house, however, is available in four different sizes rather than just three. It comes in extra small, small, medium, and large, so selecting the right size for your own dog should be very easy. Also, the roof is sheet-lined and specially treated to be weather-resistant; if you plan on using this dog house long-term, though, you will need to re-treat the wood every few years in order to maintain the integrity of the weather resistance. 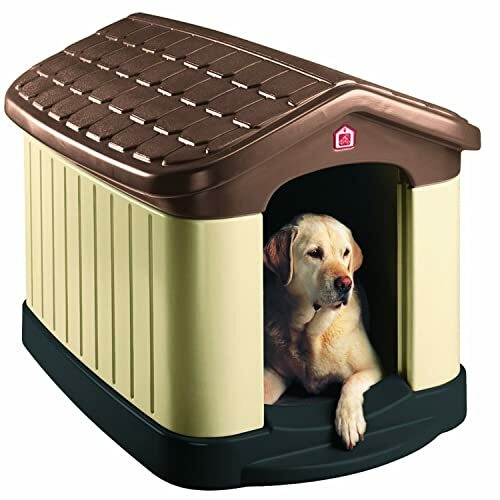 While this dog house is a bit more expensive when compared to some other brands, it’s well worth the price for how easy it is to use and maintain. This dog house has a raised floor that keeps it away from the ground, a door flap for the entrance, and a slanted roof with built-in grooves that provide easy drainage in the event of rain. And not only is this dog house easy to assemble after you purchase it, cleaning it is also incredibly simple. The floor is removable and the roof is hinged, allowing for easy access to the interior of the dog house whenever you need to clean it out. This dog house is one of the cheaper options available on the current market, and despite the low price it is still a product of very good quality. Made of incredibly strong plastic, this dog house is fairly easy to assemble; all you need to do is snap the pieces together according to the instructions that come with the product. This dog house is also very durable, and is able to withstand a wide variety of weather situations and temperature fluctuations. 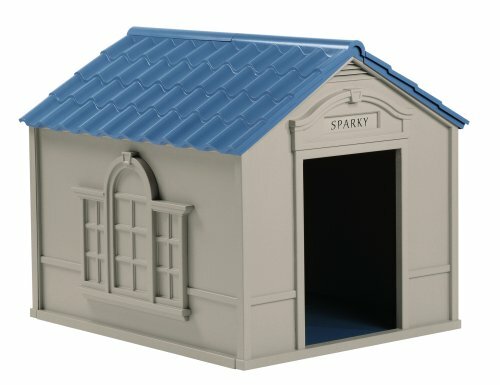 This dog house also comes with vinyl doors ,and letters that you can apply to the nameplate above the dog house entrance for the personal touch of having your dog’s name on their dog house. Overall, this dog house is a very good choice if you want a sturdy and reliable dog house for a reasonable price. We sincerely hope that this article is helpful to you as you go out shopping for a dog house for your own beloved pooch. If you have any additional information you’d like to share with us, or any questions you’d like our input on, we’d love to hear from you in the comments below. Thank you! Hi, do you advise plastic-made canine homes or timber-made canine houses? What do you think about metal canine homes?